The French Quarter in New Orleans. Photo by Sami99tr. The Acadian Museum in Erath focuses on the Cajun people and Acadian heritage of Louisiana. The small museum contains photographs, cultural artifacts and exhibits about Acadian culture. A café next to the museum offers free Cajun meals on Monday nights. Camp Moore Museum and Cemetery is the former site of the largest Confederate training camp during the Civil War. Today visitors can take self-guided tours of the groups and see artifacts from Confederate soldiers and exhibits about the lives of soldiers during the Civil War at the Camp Moore Museum. The Cane River Heritage Area is located in northwestern Louisiana and is home to plantations, Creole architecture and multicultural historic sites from French, Spanish, Creole, African and Indian cultures. Visitors can enjoy seven National Historic Landmarks, three state historic sites, 24 areas on the National Register of Historic Places and a national park. 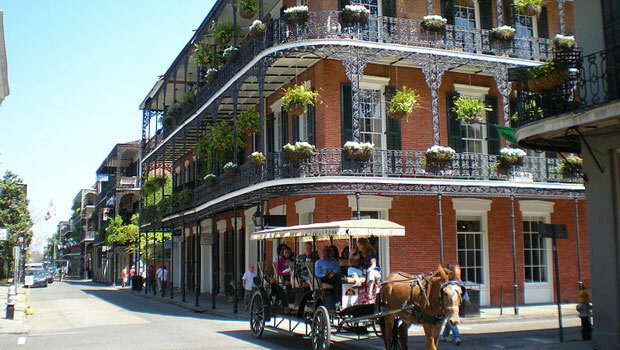 The French Quarter is the oldest neighborhood in New Orleans and a historical district in the city. Bourbon Street, the most well known street in the French Quarter, has many bars and restaurants and is a popular tourist destination. Historic sites in the area include the Cabildo, St. Louis Cathedral, Jackson Square and the Old U.S. Mint. The Confederate Memorial Hall Museum exhibits historic artifacts from the American Civil War, including weapons, uniforms and personal items of soldiers. The museum is located in the Warehouse District of New Orleans and is open Tuesday to Saturday. The Historic New Orleans Collection is a museum and research center featuring exhibits about the history and culture of New Orleans, including photographs, paintings and other artifacts on display at multiple galleries and historic buildings. The Voodoo Museum is a small museum in the French Quarter that focuses on the history and culture of voodoo in New Orleans. The museum is located in the French Quarter near Jackson Square and is open seven days a week. New Orleans is known for its music and visitors can find several jazz and music clubs to enjoy live music every night of the week in the French Quarter, including the Bombay Club, Howl at the Moon and the Funky Pirate. See a full list of music clubs here. Atchafalaya National Heritage Area contains cultural, historical and natural sites, and there are many opportunities to enjoy outdoor recreation in the area, such as kayaking, canoeing, biking, camping, fishing, hunting and houseboat and cabin rentals. Natural resources in the area include the country’s largest river swamp, the Atchafalaya Basin, and the bald cypress, the state tree of Louisiana. The Jean Lafitte National Historical Park & Preserve is made up of six natural and cultural sites in the Louisiana Delta, including the Barataria Preserve where visitors can experience Louisiana wetlands, wildlife, canoeing, kayaking and nature trails. The Gulf Coast of Louisiana has many outdoor activities, from swimming at a beach to camping to hiking to golf. Visitors can also browse a list of parks and trails in the Gulf Coast area in places like Iberia, Jefferson, St. Bernard and St. Mary. Audubon Park is a large urban park in New Orleans located between the Mississippi River and St. Charles Avenue. The large park contains a golf course, jogging path, tennis courts, playgrounds, swimming pool, soccer fields, picnic areas and horse stables. Take a swamp tour outside New Orleans to see the local landscape and wildlife of the bayou. Animals like alligators, snakes, raccoons, swamp deer, nutria and waterfowl are common sights on the tours, which are offered by many tour companies in the New Orleans area. Tour the Garden District, a historic neighborhood in New Orleans that was once home to plantations in the 19th century and is now home to many celebrity homes, the St. Charles Streetcar, the Lafayette Cemetery #1 and Magazine Street. Beignets at Cafe Du Monde. Photo by Eric Pancer. Louisiana and New Orleans, in particular, are known for its Cajun and Creole cuisine, which has been influenced from Spanish, French, Indian, Portuguese, Italian and African cultures combined with the local ingredients of Louisiana. Specialties include catfish, jambalaya, muffeletta sandwiches, Bananas Foster, gumbo, beignets, crawfish and many other dishes. 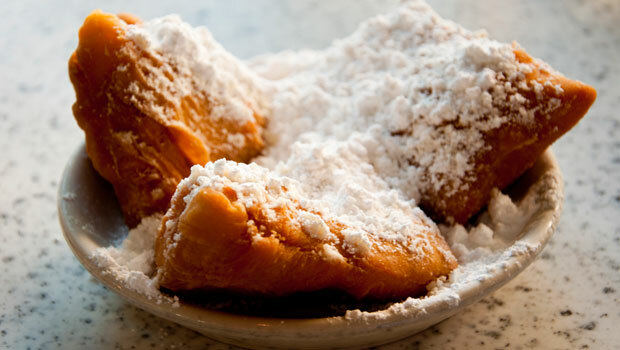 Consider taking a New Orleans Culinary History Tour to get a taste of the local cuisine! Find fresh fruit and vegetables and local homemade goods at a farmers’ market in Louisiana. Mardi Gras in New Orleans. Photo via Pixabay. 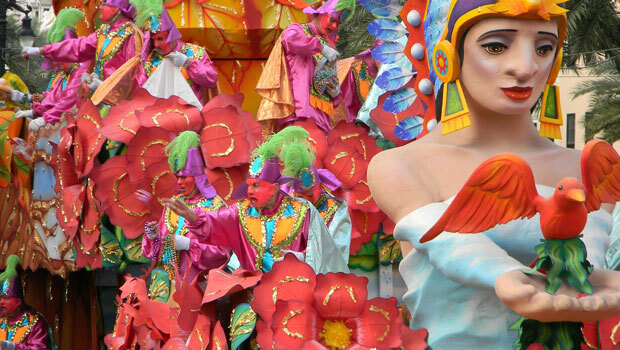 New Orleans is known for its Mardi Gras celebrations each February during the Carnival season. The festival begins on January 6th and continues until “Fat Tuesday”, Mardi Gras, which is the day before Ash Wednesday. Parades are often held each day of the season throughout New Orleans and include elaborate costumes, masks, floats, musicians and many celebrations in the city. Mardi Gras celebrations also occur in towns across Louisiana during the season, though on a smaller scale. Festival International de Louisiane in Lafayette is a free music festival focused on world music and the French heritage of the region. Held in April, the festival features many musicians that have been influenced by Acadian, French, African, Hispanic and Caribbean cultures. The festival includes live music, food, arts and crafts, street musicians and other free activities. The French Quarter Festival in April celebrates the music, food and people of New Orleans with live music from over 800 local musicians, food from some of the best restaurants in the city and other free events over four days. The New Orleans Jazz & Heritage Festival, also known as Jazzfest, is a famous music festival in April/May celebrating the musical heritage of New Orleans including jazz, blues, Afro-Caribbean, folk music, Latin, rap and other styles of music. Though the event is held at the Fair Grounds Race Course, many other venues also present shows and concerts during the festival. The 10-day festival also features food, arts and crafts and cultural attractions. Red River Revel is a northern Louisiana arts festival in Shreveport featuring live music, artists, children’s events, food vendors and entertainment from popular bands along with local musicians each October. The State Fair of Louisiana has been held for over 100 years and is currently located at the State Fair Grounds in Shreveport. Each October visitors can enjoy carnival rides, live entertainment, agricultural shows, cooking competitions, food vendors, children’s events, a rodeo, a circus and live concerts. Canal Streetcar in New Orleans, Louisiana. Photo by Didier Moïse. To travel around New Orleans, take one of the many RTA buses or a historic New Orleans streetcar. In the state capital, Baton Rouge, use the Capital Area Transit System (CATS) for service in Baton Rouge, Baker and Zachary. The SporTran transit system operates 17 bus routes in Shreveport and Bossier City. For public transit systems in other areas of Louisiana, visit the American Public Transportation Association website. Greyhound operates in a limited number of Louisiana cities via the Greyhound Express service. Megabus travels from New Orleans and Shreveport to locations like Atlanta, Houston, Mobile, and Montgomery (from New Orleans) and many Texas cities (from Shreveport). Amtrak trains stop in several locations in Louisiana, including New Orleans, New Iberia, Lafayette and St. Charles. 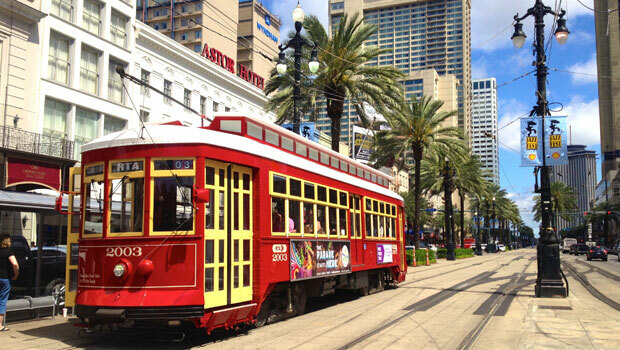 International visitors can take the Sunset Limited, Crescent or City of New Orleans lines. Volunteers work to save homes and businesses from floods in 2008. Photo by Marianne Everhart. Find a regional food bank in Louisiana to donate your time and help fight hunger. Many volunteer opportunities are available at food banks for individuals and groups, including packing meals, sorting through donations and helping out in offices. Volunteer Louisiana has many great resources for volunteers across Louisiana, including opportunities to help out in Louisiana while on vacation. Search for a volunteer job by location and/or interest to begin helping out in a local community or search for a local volunteer center. Louisiana has 15 Habitat for Humanity affiliates that help build affordable housing for families in need. 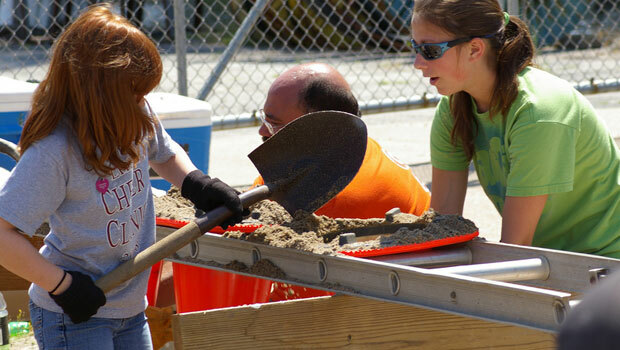 Volunteers can help build houses – no experience required – by contacting a local organization. Help rebuild New Orleans and Tuscaloosa with the United Saints Recovery Project. The organization is looking for skilled and unskilled volunteers that are willing to help. Another organization to consider is Rebuilding Together New Orleans. RTNO welcomes individuals and groups for two or more days to help rebuild homes. HandsOn New Orleans connects volunteers with organizations in need of help. Use the online search engine to find a volunteer opportunity that matches your interests, skills and availability.